The 30-second-long video shows a man clad in a white shirt viciously attacking a police official even while a woman tries to stop him. The video is being widely shared on Twitter and Facebook. You can view the viral post here and access the archived version here and here. This is not the first time this video has gone viral. Earlier too, in October 2018, the same video had gone viral with a different caption. 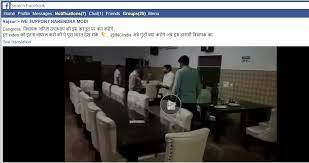 The BJP Councillor was caught on camera beating up a policeman who was with a lady advocate. 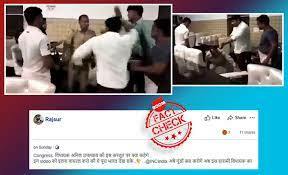 Back then, the caption had claimed that the man shown attacking the cop in the video was a Bharatiya Janata Party councillor from Meerut, Manish Kumar. When BOOM searched the internet for reports on the incident, we found out that the man assaulting the cop in the video was indeed Manish Kumar, a BJP councillor from Meerut. 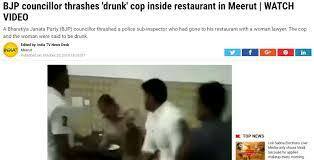 News reports said that the viral video was shot at a restaurant owned by the BJP councillor. According to reports, an argument between the cop and a hotel staff led to the brawl. The cop was accompanied by a woman lawyer. The reports further stated that the councillor was booked under Sections 395 and 354 of the Indian Penal Code (IPC). BOOM contacted the Meerut police for more information. The report will be updated once we get a reply. You can read more about the incident here and here.